The predecessor to TFCC was the Thai-Finnish Trade Association (TFTA). The inspiration for the association came in May 1988 in connection with a visit to Finland by the Thai Business Delegation, headed by the Prime Minister of Thailand, who at that time was General Prem Tinasulanonda. In February 1989 an inaugural meeting of the association was held. In the presence of both Finnish companies in Thailand and Thai companies with a business interest in Finland, the objective was defined to serve and promote trade activities between Thailand and Finland. The Thai-Finnish Trade Association was officially established on the 6th of March, 1989. The Thai-Finnish Chamber of Commerce (TFCC) was granted charter on September 21, 1992 by the Royal Thai Ministry of Commerce. 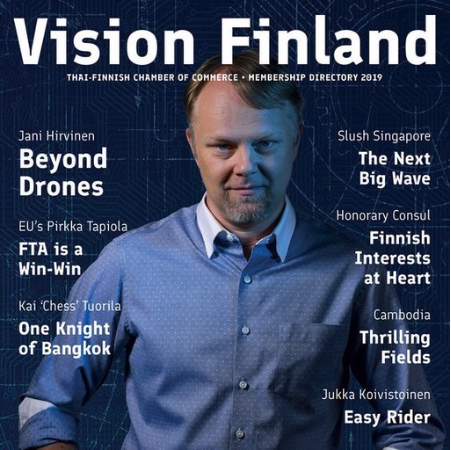 The primary objectives were initially to act as a contact, resource and information point for Finnish businesses in Thailand and for Thai enterprises interested in doing business with Finland as well as to develop relations between the two countries in all areas. TFCC is a member of the Board of Trade of Thailand (BoT). TFCC is a member of, and works closely with the Joint Foreign Chambers of Commerce in Thailand (JFCCT) on issues of common concern for foreign companies in Thailand. The monthly Presidents’ Council Meeting provides an excellent forum to meet and exchange ideas with other foreign chambers of commerce. The organization, policy, objectives and goals of the Chamber are defined, directed and implemented by a minimum of 7 and a maximum of 15 elected members of the Board of Directors. It is headed by the President who has Vice Presidents to assist him. The day to day tasks are handled by a full-time permanent staff. TFCC arranges yearly many events and provides many services to its members. TFCC’s traditional Finnish events include the Vappu Party and the Pre-Christmas Party. TFCC is also acting as a co-host for the most interesting events yearly organized mainly by one of the other 40 international chambers of commerce. Starting in 2018 the Nordic Chambers’ cooperation (Denmark, Sweden, Norway, Finland) offers Nordic Events and Nordic Partnerships to companies interested in the business opportunities with the Nordic companies and Nordic communities in Thailand. Together the Nordics can match better the competition in the marketplace offered by the bigger chambers of commerce. TFCC also works very closely with the Embassy of Finland in Thailand and with the Business Finland as well as with the Finncham organizations. Together Team Finland thrives to offer a maximum service to the Finnish companies wishing to enter Thai markets and the Southeast Asian market. TFCC is constantly planning new services to its members and partners. We will always hold discussions with companies who want to join us either as a corporate member or as a Partner and get to know the new member and their goals for the membership. TFCC provides general knowledge that every new member needs especially if this company and/or these people are new in Thailand. For the more detailed help TFCC Board members offer mentoring and important contacts from our vast networks. At this moment TFCC offers three types of engagement with our chamber: Partnership, corporate membership and individual membership.